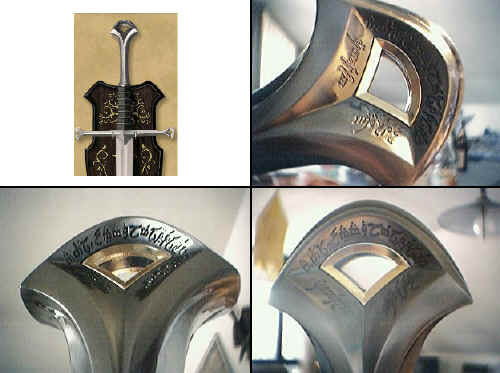 Below I present all the Elvish inscriptions which can be seen on the sword blades found in The Lord of the Rings movie trylogy. First image came from the Movie Calendar 2002 (message from Patrick a.k.a. Gorel). 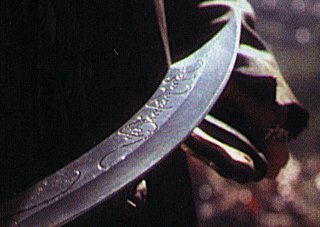 The Sting's Inscription on blade is written in Sindarin in tengwar letters (Mode of Beleriand). 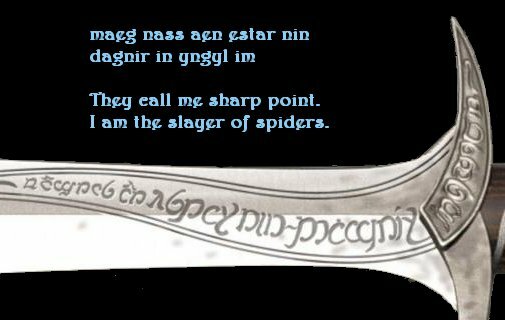 Patrick: This is my amateur transcription and translation of the Sindarin on the blade. Evidently "sharp point" is being used for 'sting'. It's interesting because it suggests the elves placed the writing on the blade while Bilbo was at Rivendell. What a nice way to honor the old hobbit. Compare this photo with another one published by Patrick. According to Kit Rae, an Art Director of United Cutlery Corporation, the official 'poetic' translation of this inscription is: Sting is my name, I am the spiders bane. LotR movie artifact designed by Weta Workshop. Inscription on guard is in Sindarin and in cirth runes. Partly deciphered by Javier Lorenzo and Ryszard Derdzinski. According to Kit Rae, an Art Director of United Cutlery Corporation, the official translation of this inscription is: Turgon, king of Gondolin, wields, has and holds the sword Glamdring, foe or Morgoth's realm, hammer to the Orcs. Fully revealed in the Official Movie Magazine #2.
tortha v. '[he] wields'; cf. tortha- 'to wield, to control'. gar v. '[he] possesses'; cf. gar- 'to hold, to have'. matha v. '[he] handles'; cf. matha- 'to stroke, to feel, to handle'. vegil n. 'sword'; lenited form of megil. gûd n. 'foe'; < CE *ñgoto, *ÑGOT-, ÑGOTH-. daedheloth n. 'Morgoth's Realm' lit. 'great-fear'; cf. daer 'great', mut. dheloth is a lenited form of deloth 'abhorrence, loathing'. It is interesting that in the inscription this name is transcribed as daelo. It can be an intentional omission of parts of the unnamed name. First seen as the LotR movie artifact from Casa Loma exhibition. Fully revealed in the Official Movie Magazine #2: Given to Aragorn by the Elves of Lothlórien, we suppose it to be an old blade, but its history is unknown. Sindarin in tengwar (Mode of Beleriand). The photo from Fotki.com and Official Movie Magazine #2. According to The Art of 'The Fellowship of the Ring' this inscritpion means 'Foe of the Morgoth's Realm'. daedheloth n. 'great-fear'; cf. daer 'great', mut. dheloth is a lenited form of deloth 'abhorrence, loathing'. First detailed sight in the National Geographic video 'Beyond the Movie'. Fully revealed in the Official Movie Magazine #3. According to Kit Rae, an Art Director of United Cutlery Corporation, the movie background for the name Hadhafang is this: It once belonged to the Elvish princess Idril, who wed a mortal man Tuor and bore Eärendil, the father of Elrond who in turn was father to Arwen. According to Trueogre: "Originally, Arwen's role in the trilogy called for her to carry a sword for several scenes, so a special sword was made for her. Tolkien language scholar David Salo suggested that this weapon may be ancestral heirloom of Arwen's family, perhaps originally belonging to Idril, daughter of King Turgon of the lost kingdom of Gondolin. It would have come to Arwen through her father Elrond, who in turn would have inherited it from his father Eärendil, son of Idril, Arwen's great-grandmother. As The Lord of the Rings screenplay evolved, Arwen eventually came to wield the sword in only one scene. The moviemakers theorised that the blade would remain in Rivendell, along with other historic weapons such as Aiglos, in the grand chamber in Rivendell. They supposed Arwen would have grabbed it on her way out the door to meet Aragorn on his way to Rivendell with the Hobbits. They also chose to give this sword to Elrond to use in the Second Age battle seen in the prologue of the film, so there is the linkage of seeing the weapon in the opening scenes carried by Elrond and then later in the first film, this time thousands if years kater, wielded by Arwen. There is further symmetry in that, like Arwen, Idril was an Elven princess who wed herself to a mortal man. thand arod dan i thang an i arwen. Hadhafang n. 'Throng-cleaver'; cf. LR 389. Tolkien devised this Sindarin name for a sword but never used it in any of the tales; David Salo suggested employing it here. i chathol n. 'the sword-blade'; lenited form of hathol. i thang n. 'the throng [here: 'the enemy throng']. i arwen n. 'the noble-maiden' (compare the name Arwen). 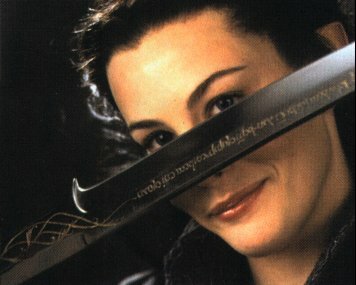 There is an international pun in the inscription - the Sindarin translation of 'noble lady' is arwen, so in effect, the blade claims to be for Arwen, even though it was made for her grandmother. Idril n. a name; Q Itarildë. i hen n. 'the daughter'; lenited form of sel. en aran n. 'of the king'. Gond Dolen n. 'Hidden Rock' (compare the name Gondolin). 5. Aiglos - Gil-galad's Spear. First revealed in the Official Movie Magazine #3. 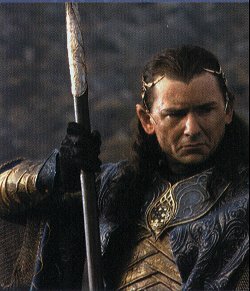 A spear of of Gil-galad, high king of the Noldor Elves in the Second Age. The very tengwar inscription has not yet been revealed, but it can be reconstructed as below the photo. Gil-galad n. name of the high king of the Elves in the Second Age. vae adv. 'well'; lenited form of mae. vaegannen adj. 'well-made; well-shaped'; vae 'well', lenited form of mae + gannen 'shaped', lenited form of cannen, p.p. of *canta- 'to shape'. i orch n. 'the Orc'. gostatha v. 'will fear exceedingly'; cf. gosta- 'fear exceedingly'. cíniel v. perf. 'having seen'; cf. *cen- 'see'. na nguruthos adv. 'in fear of death'. istatha v. 'will know'; cf. ista- 'know'. Aiglos n. 'Icicle; point of ice'. 6. Narsil - Aragorn's Sword. 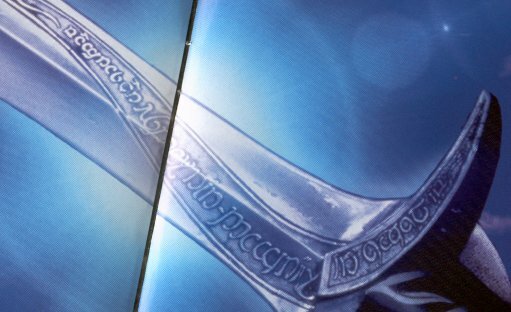 The first information about Narsil's inscription in Quenya comes from Kit Rae, an Art Director of United Cutlery Corporation. Fully revealed in the Official Movie Magazine #2. The sword of Elendil that was broken at the end of the Second Age. Inscription can be seen on the sword pommel. In the thrid film The Return of the King, when Narsil is reforged as Andúril for Aragorn, an inscription is made on the length of the blade as well, but that translation will have to wait until the final film is released. Narsil n. 'Red [and] white [flame]' according to the Index in The Lord of the Rings; cf. Anar 'Sun' and Isil 'Moon'. essenya n. 'name-mine'; cf. esse 'name', and possessive ending -nya 'my'. Telchar n. name of a dwarvish smith from Nogrod; uncertain origin - maybe from Sindarin? carnéron v. 'he made me'; from carne-ro-n 'made-he-me'. The pronominal form -ro 'he' is very problematic. It comes from the early version of Quenya (Tolkien's papers from 1930s). According to many linguists its later form is rather *-rye, *-re. 7. Andúril - Aragorn's Sword reforged. The first information about Andúril's inscription in Quenya came from TheOneRing.net. The Quenya inscription on the pommel is virtually the same as Narsil's inscription analized above (Andúril is reforged Narsil). New inscription is the one on the blade: Quenya text written in Angerthas Eregion (Elvish runes). It can be seen below. Nányë Andúril i né Narsil i macil Elendilo. I am Andúril who once was Narsil, sword of Elendil. The slaves of Mordor shall flee from me. I-am Andúril which was Narsil the sword of-Elendil. nányë v. 'I am'; ná-nye 'is-I'. né v. 'was'; reconstructed preterite of Quenya ná 'is'. lercuvanten v. 'they will flee from me'; future tense of *lerca- 'flee' (reconstruction after Sindarin drega- 'flee', *DERĒK-): lerc-uva-nte-n 'flee-will-they-me'. NOTE! The Cirth inscription seems to be erroneous in two places. The word Anar is transcribed in Elvish runes as Dndr and Andúril as dndúril. It seems the sword-makers had in mind Germanic rune a, not the Elvish a. First revealed in the Official Movie Magazine #2. A Dwarven spear that the Cave Troll sweeps up to use in his attack on the Fellowship in the battle in Durin's tomb. Language of inscription down haft, on alternation faces is in Khuzdul, language of the Dwarves. The cirth inscription below is reconstructed, because no its original picture is available. Very little information exists regarding Khuzdul compared to what has been written about the Elvish languages. 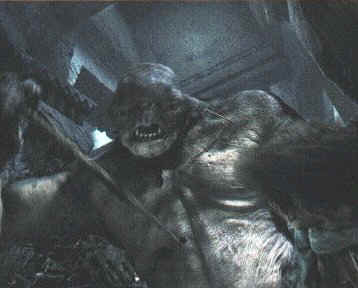 Because Weta was unable to find a Dwarvish word for troll, it was suggested to use a Dwarvish reconstructed form based on the Sindarin term torog, meaning 'troll'.